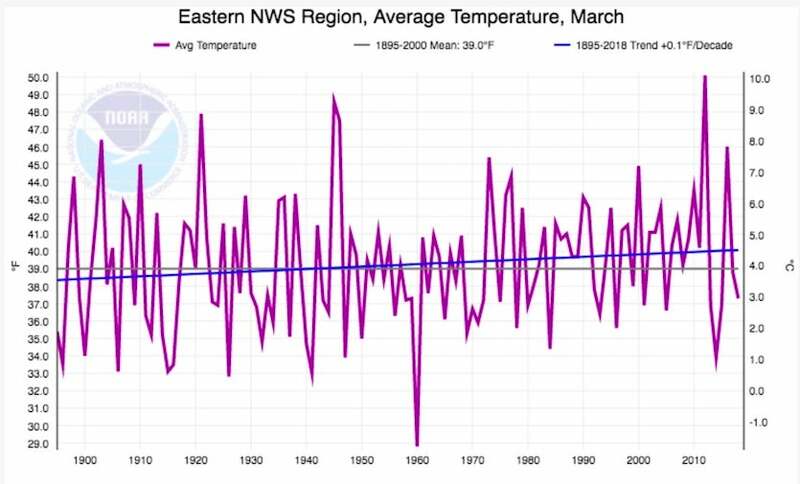 NOAA: March Ignored the Calendar across Eastern U.S. 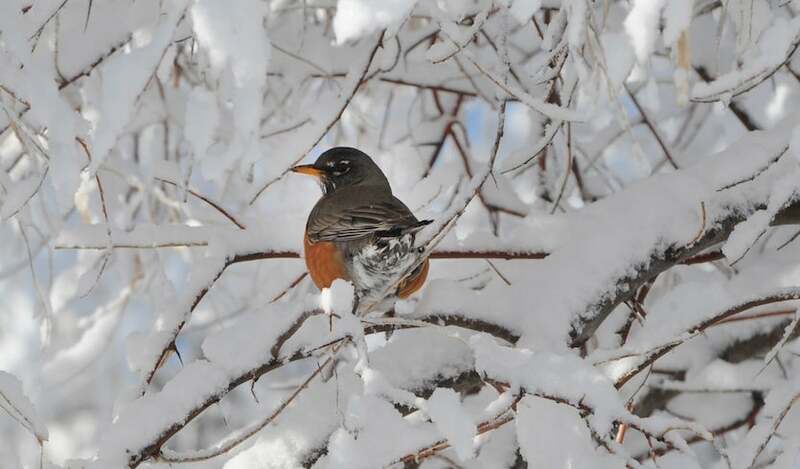 Above: A robin perches among the snow-covered branches along West Tollgate Creek in Denver’s Pioneer Park on March 27, 2018. Image credit: Steve Nehf/The Denver Post. The seemingly endless string of nor’easters that afflicted the U.S. East Coast during March played a big role in shaping U.S. climate for the month, according to NOAA’s monthly summary issued Friday. The report confirms that relatively cold weather dominated the eastern U.S.—in many cases, colder than February—while the Southwest and Southern Plains were unusually warm. Nationwide, the month ended up as the 55th warmest and 55th wettest March out of the last 124 years of recordkeeping for the contiguous U.S., according to NOAA. 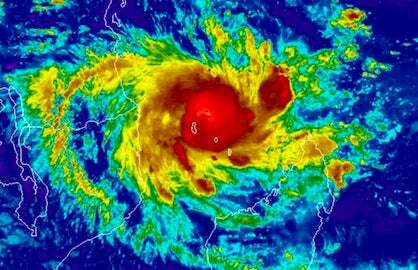 Despite the freight train of intense storms, the overall pattern was progressive enough to keep the weather reasonably varied. 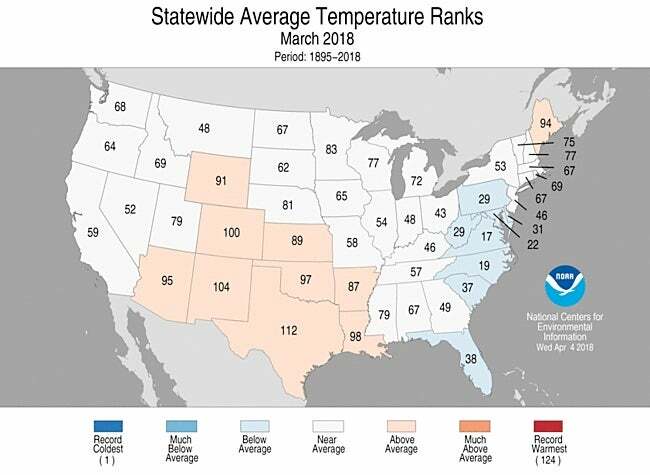 Not a single state made it into top-ten status for their coldest or warmest March on record. Virginia did see its 17th-coldest March, with most of the surrounding mid-Atlantic states not too far behind. In contrast, New England was relatively mild for the month as a whole, as the relentless nor’easters pulled marine air across the region. The month ended up near average for temperatures across most of the Northwest and Northern Plains, and considerably warmer than average over the Southwest and Southern Plains. Texas had its 13th warmest March. The nation saw a preliminary total of 626 record highs and 253 daily record lows for March, according to NOAA’s National Centers for Environmental Information (NCEI). As of April 3, this year had racked up 7171 record highs and 5700 record lows, according to NOAA/NCEI. The year thus far (Jan-.Mar.) is the 24th warmest on record for the U.S., and the 10th warmest for Arizona, New Mexico, and Maine. Figure 1. Statewide rankings for average temperature for March 2018, as compared to each March since records began in 1895. Darker shades of orange indicate higher rankings for warmth, with 1 denoting the coldest month on record and 124 the warmest. Image credit: NOAA/NCEI. “Marchuary” tops February for chilliness in the eastern U.S. It doesn’t happen too often, but sometimes a U.S. city will experience a March that’s colder than the preceding February. This past March pulled off the “Marchuary” trick in dramatic fashion, with much if not most of the Northeast experiencing colder weather than it did the month before. For many locations, it was the second straight year of Marchuary conditions. All three of the cities below (New York, Washington, and Cleveland) had a “Marchuary” in the years 1890, 1960, 1984, and 2017. In several other years, at least one or two of these cities managed the feat. Feb. 2018 Mar. 2018 Mar. colder than Feb. Figure 2. Average March temperatures across the Northeast U.S., 1895-2018. In this region, March is now averaging betwen 1°F and 2°F warmer than it was at the turn of the 20th century. 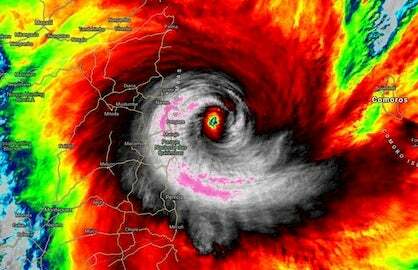 However, the month has seen no significant warming since the 1970s. Image credit: NOAA/NCEI. Interestingly, March has been a specific outlier from the Northeast’s overall long-term warming trend. All but one of the last 20 calendar years have been warmer than the century-scale average (1895-2000) across the NWS’s Eastern Region, which extends from Maine down to South Carolina and westward to Ohio. Yet across this same region, five of the last six Marches have produced temperatures below the 1895-2000 average (see Figure 2). Several of the prolonged bouts of March cold have been associated with late-winter weakenings of the stratospheric polar vortex that typically keeps colder air locked up at higher latitudes. Some research has suggested that these weakenings are becoming more common in association with a warming Arctic, a topic we covered in a February post. The famed cherry blossoms of the Tidal Basin in Washington, D.C., finally made it to peak bloom on April 5, according to the National Park Service. The buds got off to quite an early start, with green color first appearing on February 25, but the chilliness of March slowed their progress. In online records going back to 1992, this year’s 39 days from the appearance of green color (Feb. 25) to peak bloom (Apr. 5) is tied with 2001 for the longest such span on record. 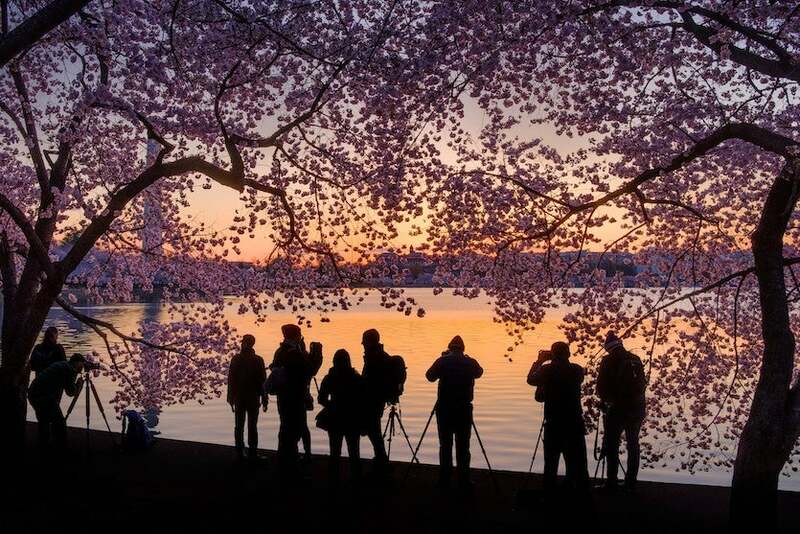 Peak bloom is defined as the point when 70% of the Yoshino variety—the most abundant of the roughly 3700 cherry trees around the Tidal Basin and near the Washington Monument—are in full bloom. From Montana to New England, snowfall continued to punctuate the onset of spring. Frequent snows helped give North Dakota its 11th-wettest March on record and South Dakota its 21st-wettest. Long-suffering Glasgow, Montana, saw its second snowiest March on record on the heels of its second snowiest February. The two months delivered a total of 36.4”, more than Glasgow’s typical snow total for an entire winter. Figure 4. 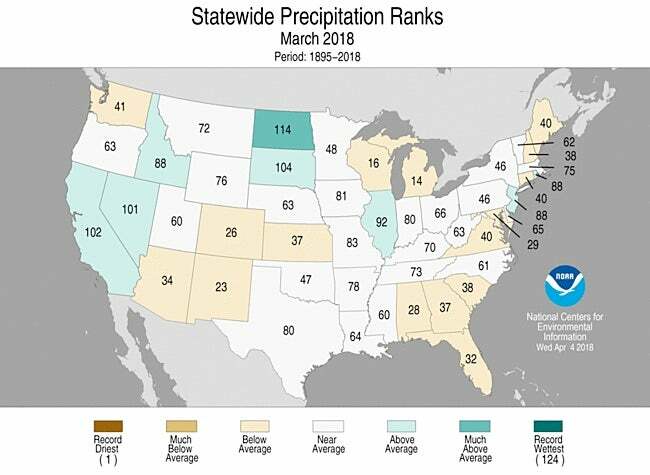 Statewide rankings for average precipitation for March 2018, as compared to each March since records began in 1895. Darker shades of green indicate higher rankings for moisture, with 1 denoting the driest month on record and 124 the wettest. 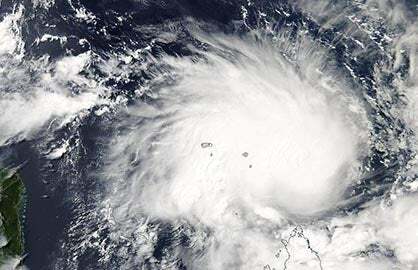 Image credit: NOAA/NCEI. After its 6th-driest October-to-February period on record, California finally got on the moist side of the ledger with its 23rd-wettest March. Several strong storms pushed the Sierra Nevada’s snowpack up to around half of its average value for April 1. 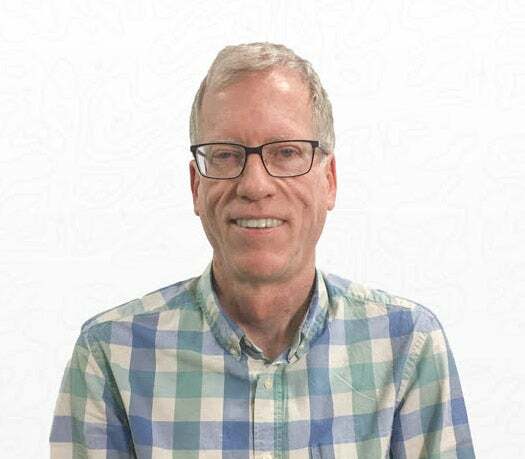 “A good March, but certainly not a great March, and by no means even close to the ‘March miracle’,” said Frank Gehrke, direct of snow surveys for the state’s Department of Water Resources. Meanwhile, extreme to exceptional drought strengthened its grip over much of the Southern High Plains in March, as temperatures began to warm and the soil continued to dry out. Amarillo, Texas, managed to rack up 0.24” of rain on March 27, but it was a metaphorical drop in the bucket. During the preceding 163 days, Amarillo saw just 0.01” of moisture. The city is also on track for its first-ever winter without any measurable snow, which would break the record-low accumulation of 0.5” from 1950.